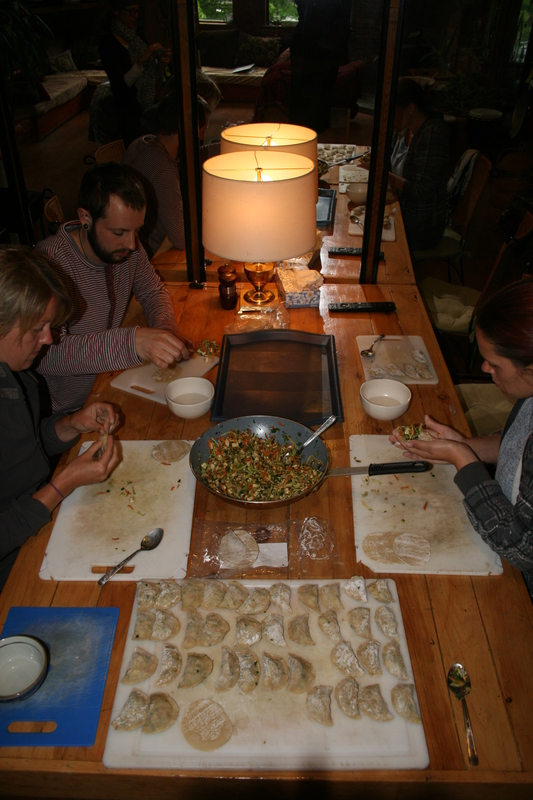 We call this dumpling-satsang–spending the evening with young yogis, Sarah, Mandy & Jody making dumplings, listening to chant and chatting! Make a slaw of shredded cabbage, broccoli slaw, carrots, and a substantial amount of finely chopped green onions & substantial amount of chopped cilantro into a big bowl. fill dumplings by holding wrapper, smoothing water on half the lip, placing a large tablespoon of filling in center and pinching together the dry lip to the moist one, lay out finished ones on cutting board, place cutting board in freezer for a couple of hours then bag up your frozen dumplings for the future. Cook from frozen by simmering gently in small amount of cooking oil (grapeseed or peanut) till both sides are crispy.